Acorn Rentals (www.acornrentals.com.au) delivers rental cars to customers after an auto accident. Now Acorn’s drivers travel with FileMaker Go on their iPads, so they deliver an even better customer experience along with the cars.Acorn’s drivers typically deliver a rental car to their customers at an auto repair shop. 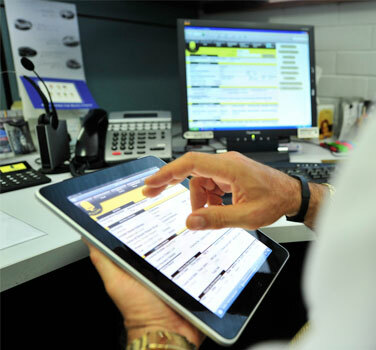 With an iPad running FIleMaker Go in hand they enter customer and vehicle details directly into the firm’s main database at headquarters. Then the customer receives a copy of the documentation by email. Customers waiting for a rental car want to get their replacement and get going as fast as possible. In its role as “clipboard replacement”, the iPad eliminates an intimidating amount of forms and copies, removes the need for rekeying of customer data, and eases and speeds the whole experience for the customer. “The moment we found out about FileMaker Go for iPad, we instantly switched over to it and abandoned our previous costly, complex mobile development effort,” says Aaron Martin, national operations manager for Acorn Rentals. For Acorn and its customers, the benefits of adopting the iPad and FileMaker Go are immediately evident – fast time-to-market for an advanced iOS solution, improved productivity, reduced costs and enhanced customer satisfaction. “With FileMaker Go, we now deliver a customer experience that is unrivalled by any car hire firm in Australia and was achieved without a huge development budget and specialized hardware,” says Martin.